Why a "Turnery?" What is a Turnery after all? According to Webster's, a Turnery is "the work, products, or shop of a turner". That's the what part. In order to gain an understanding why the name may not be simply a name, let's first look at a debate in the community of which I am a member. There is an interesting debate occurring now in the wood community. Many wood artists are using the lathe to begin the accomplishment of their work, following on with carving, texturing, coloring, and other embellishments to achieve their final objective. Many others are completing their work nearly entirely on the lathe. The more accomplished each of these groups seems to become, the more they tend to disagree about what to call themselves. Many of us refer to ourselves as "turners," showing an homage to the practice of turning wood that goes back in antiquity. Others refer to themselves as "wood artists," or simply "artists," arguing (quite justifiably) that no other group of artists name themselves by their tools so why should we. I find myself in agreement with both camps, which makes me a bit of a pariah in both camps as well. Of course we are artists (or crafts-persons, which is an entirely different debate). We also are a unique stripe of artist; we are turners, as other artists are (for example) sculptors or painters. It is not the lathe which gives us our name, it is the process we employ. Painters are "visual two-dimensional artists" while sculptors are more nearly "visual three-dimensional artists." The point of all this is to ruminate on a slightly different question -- whether ShopDog Turnery is a Shop or a Studio; a place of Craft or a place of Art. My nephew (a sculptor) says I should call the turnery a Studio, while his father (also a sculptor) says my work is more nearly that of a craftsman working in a Shop. Thus, since even my family is divided, I choose to refer to my place of creation as a Turnery, since whether it is Art or Craft, whether it is Shop or Studio, it is principally a place where an artisan uses a lathe to turn wood - a Turnery. So who is the ShopDog? Some time back, when I finally got around to actually constructing a free-standing building in which I could pursue my passion for working with wood, particularly turning, it was suggested that I needed to name the place. The name was actually quite easy. Rather than name if after some ephemeral notion or long dead god, I chose to name it after the one who spent almost as much time in the building as I do; Molly. Molly was a Basset Hound who was with us since she was found along the road by a friend who could neither locate her previous owner nor keep her. She called JoAnn and Molly came to be part of our family. She quickly took up day-residence in the turnery, snuffling in the corners and napping in the shavings. In short, she became the shop dog. Thus the name ShopDog Turnery. Eventually I taught her the fundamentals of wood turning and she has since taken over the roughing out of raw stock to usable timber; she does the 'ruff' work. We have the pictures to prove it (no, they're not PhotoShop products, not at all ...). That's our story and we're sticking to it!! Molly is no longer with us. Currently the shop dog is Cooper; another Basset Hound has taken up residence in the Turnery. Cooper is not as accomplished a turner as Molly was, but he makes up for it with his enthusiastic barking -- he has taken on a different sort of "RUFF" work. 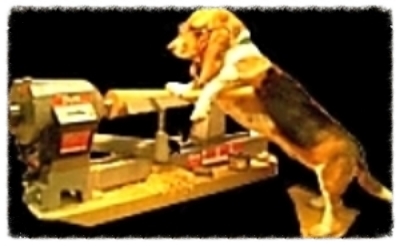 ShopDog Turnery is located in the Piedmont of North Carolina, just north of the town of Elon, between Altamahaw and Ossipee. If you are in the area and would like to visit, give a call on (336) 584-4228 and we will arrange for you to come out.